This is a beautifully updated clean condominium inside and out. The complex just completed a major exterior renovation. You will love our professionally decorated two bedroom condo. Shell Cove Condominium sits directly on the beach. No kidding, four steps and your feet are in the sand! 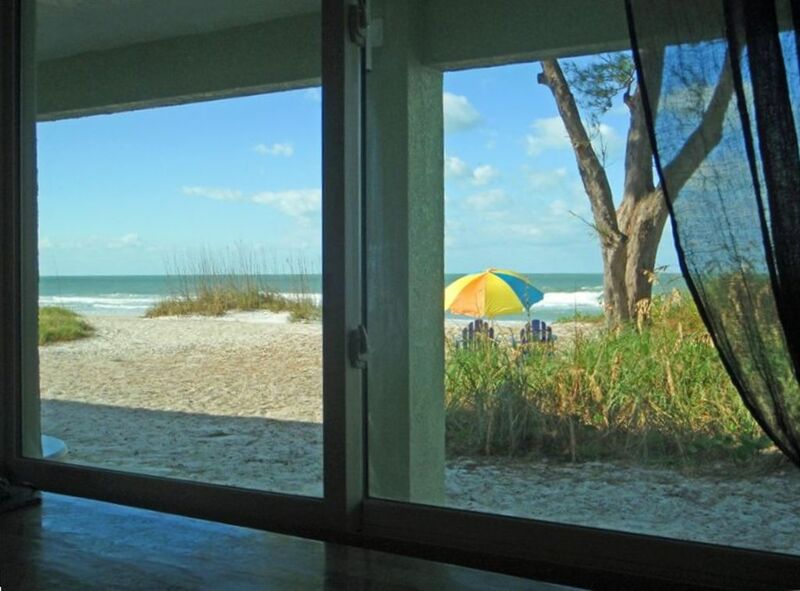 Wake up to the sound of waves breaking right outside your front door. Watch the sunsets and dolphins play as you sit in the living room. This is truly Old Florida. Enjoy Anna Maria Island's white sandy beach, waterfront restaurants, quaint shopping and even a local theater. The free trolley has a stop across the street and invites you to visit the entire Island. Please feel free to email or call me for any questions you may have. We do allow one pet under 20 pounds. We reserve the right to have the pet removed to a kennel if there are noise complaints from other owners/renters. There is a pet fee that is non-refundable of $200. The guidelines for size of the animal is a condominium association rule so no exceptions are permitted. We are from Cazenovia, NY and have been vacationing on the island since 1981. We also have a place 2 miles down the road from this rental property. Anna Maria Island gives you the Old Florida feeling that high-rises and new construction cannot deliver. The location is tough to beat. 4 steps out the door and you are on the white powder sand of the beach! Enjoy the free trolley that stops right across the street. There are many very unique restaurants like Mr. Bones BBQ @ 3000 Gulf drive or try the new Caribbean feel of Jam-Rocks @ 1800 Gulf Drive. For more restaurants ask us for we address. There is one spot for the renter and there are 2 guest spots available to all units. (2) 32 inch flat screen tv in living room and 27 inch in bedroom. WIRELESS INTERNET INCLUDED!!! This location is the best! Easy to get to, easy to find & steps from the ocean! The unit is clean, well kept & includes everything you would need! Courtenay was timely with responses to our questions! I highly recommend & would rent from Courtenay again! Thank you for the kind words Jodelle. You were a pleasure to rent to! Could not ask for a better location! Step out the door and within three steps you are in the sand. The water was about 100 ft or so! Great beach to walk along. To sit outside the unit and watch the sunsets was spectacular! The unit met our needs. Had what we needed to have a relaxing time away from the cold and snow. Would go again!! Thank you for being patient with us while the cable was being taken care of. Perfect! This lovely unassuming place is paradise! The happiness is in the details. The little things. Like waking up to the sound of the waves. The soft sand from your doorstep to the water (this really is just a few steps). Having enough towels and pillows. The Keurig! The beach in front of the condo not being crowded. All of this led to an amazing time. We relaxed and soaked up the sun in this perfect spot. I can not imagine a more perfect place. We are hoping to come back. So very happy with the condo and all neighbors. Great unit, clean and well stocked. Thank you! The location of this condo is beautiful. Close to restaurants and grocery store. Beach toys and chairs were in condo to share. Condo was quiet. Never heard any loud neighbors or anything. Our main disappointment was that the beds were very uncomfortable. The master bed springs are very loud; just turning over in bed would wake me up. The 2 twin beds weren’t very comfortable either. They are all just old spring mattresses. Kitchen could use a real deep cleaning. If mattress ever get replaced, I’d stay again. The location on this condo really is amazing. You are just steps from your front door to the sand. We could sit on the patio and just watch the waves. Everything inside the condo was to be expected for a beach place. The only recommendation would be to put in some newer mattresses as these were a bit stiff to sleep on. Overall we'd definitely recommend and come back in the future.